An older proposal for expanding the Spokane County UGA in March of 2013, before the Spokane County increased its population projection. 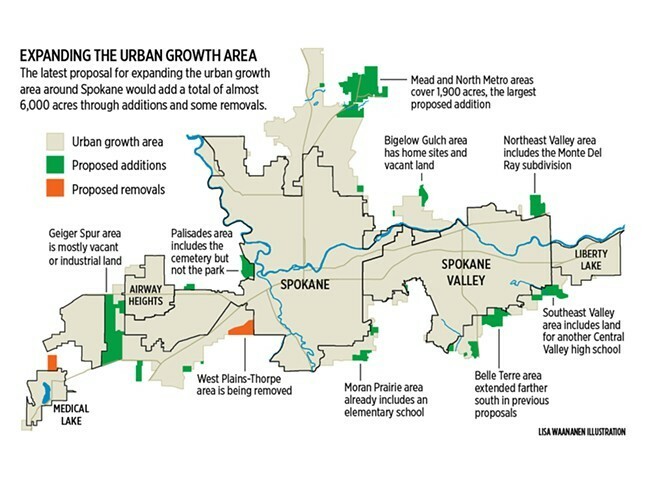 Want a quick primer on the Urban Growth Area boundaries, vesting, and why that matters for the future of Spokane County? We made a fun explainer using Monopoly pieces. Feel you already have a decent understanding? Then you'll get the gravity of the fact that, last week, an appeals court confirmed the Growth Management Hearings Board conclusion that Spokane County's expansion of the Urban Growth Area in 2013 was invalid. To be clear, neither the appeals court nor the Growth Management Hearings Board focused on whether the expansion itself was justified. Instead, before the larger aspects could even be considered, the county's decision was invalidated for failing to live up to public participation standards. The county did not fair well defending its actions in court. "It was a pretty brutal oral argument," says the Center for Justice's Rick Eichstaedt, who has often clashed with the county over growth lawsuits. "At one point the court laughed at the county attorney who was arguing it." The problem stemmed from how the county, late in the process, changed their projection of future population growth. Instead of using a population projection to calculate how much the Urban Growth Area should be expanded, the court pointed out, it selected their desired UGA expansion first, and then changed their population projection to fit it. "I agree with you that, yes, we're saying that the UGA boundary is going to tell us what population projection we have to adopt, but it wasn't simply a 'desire' kind of a decision," the county attorney told the Growth Management Hearings Board. "It was a complex decision that was made, we believe, under the requirements of the GMA." The reasoning raised plenty of eyebrows before the growth board and the appeals court. But legally, the problem was that the county hadn't given public notice that it was changing the population. [T]here is no evidence in the record that the County had considered a change in the population projection until after it expanded the UGA boundary and the period for comment and review had passed. By increasing the population forecast to fit the UGA boundary expansion desired by the County, the County effectively turned GMA planning procedures on their head, and deprived the public of its opportunity for review and comment. Population growth predictions are the foundation of effective long-term comprehensive planning. As just detailed, the legislature has entrusted the [Office of Financial Management] to prepare countywide population growth projections and entrusted counties, in turn, to designate UGAs based on these projections. ...the size of a UGA cannot be calculated without knowing what population a county is planning to accommodate within the expanded UGA. In fact, the court argued, considering that the original population projection was lower, it was especially important to give notice over the change of population projection. Given that the County's planning process revealed that the existing UGA contained an urban population surplus in excess of projected growth, it would not have been unreasonable for a person to believe that the County would reject the proposed expansion or even reduce the size of the UGA. County Commissioner Todd Mielke says he's been frustrated by how much local and state tax revenue has been spent in legal battles over comparatively minor figures. So what happens next? "Why don’t we take all of our land use issues and sit down in mediation to resolve all these?" Mielke says the county concluded. Spokane County has sat down in official mediation with the Center for Justice, the Neighborhood Alliance, Futurewise, the Washington state Department of Transportation, the Washington state Department of Commerce, and a few property owner attorneys to come to an understanding on not just the UGA, but a whole host of other land-use issues. The goal, Mielke says, is to get all the issues resolved by the end of the year. "It has allowed us to have a deeper discussion than we have every had before," Mielke says. "Everybody got to get stuff off their chest so to speak about the frustrations with the other parties. 'What were you trying to do when you did this?'" "We are engaged in productive discussions," Eichstaedt says. "We're optimistic we may reach agreements." Read the entire case below.